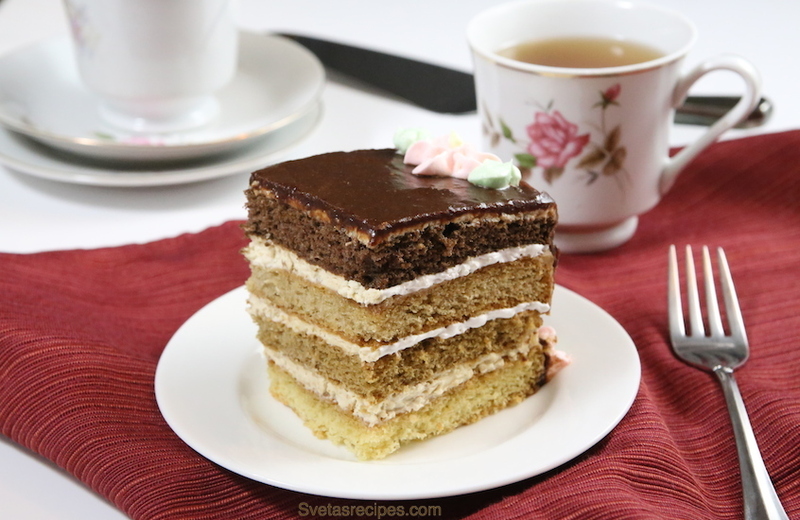 This four layer Cappuccino cake is definitely one of my favorites to make. It is beyond delicious and very soft. 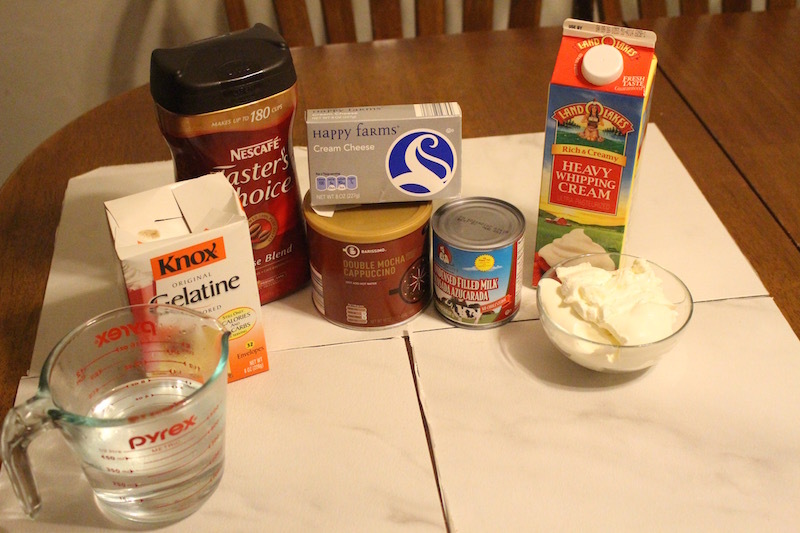 With these ingredients we are making 2 layers from the total of 4 layers that we will make. 1) Put in all the eggs into the mixer bowl and start it on medium speed. While it is mixing add sugar to the mixture. Mix it until it becomes fluffy and is double the size. 2) Add baking powder/sifted flour and mix well with a spatula. 3) Cover a baking pan with a baking sheet and spray with stick resistance spray. 4) The mixture we just made we will split into two equal portions. The first portion we will pour onto the baking sheet (let it spread all over baking pan and make it even with a spatula) bake for 30 minutes at 350 F , or until tooth pick inserted deep into the center comes out clean. 5) The second portion that we have we will add cacao and mix it well. It will be a light brown color after you mix. The we pour it onto a different pan and bake for 30 minutes at 350 . 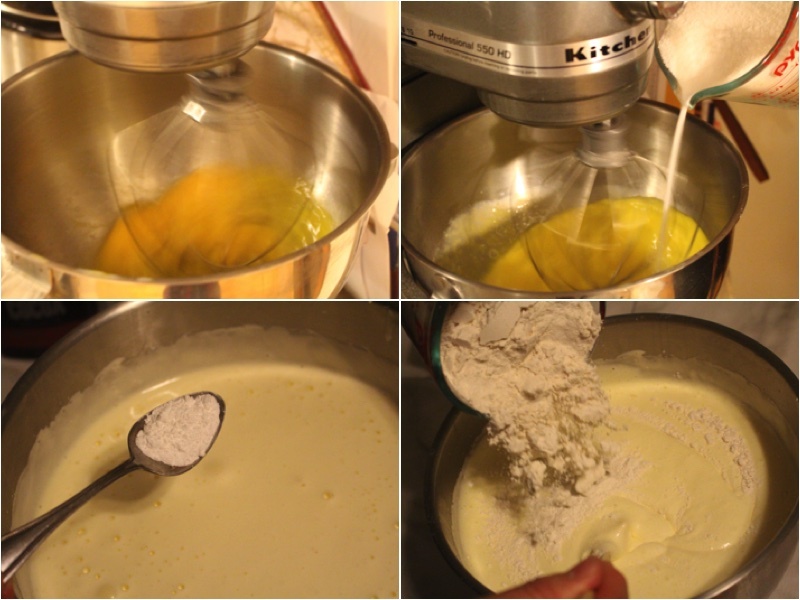 6) Put in all the eggs into the mixer bowl as you previously did and start mixing it at medium speed. While it is mixing add sugar. Let it mix until it is fluffy and double the size. 7) Add sifted flour to the mixture and mix well with a spatula. We will do the same thing here as we did above with diving the mixture into 2 equal portions. 8) The first portion we will add cappuccino to and mix it. Then pour onto a baking pan and bake for 30 minutes at 350 F or until tooth pick inserted deep into the center comes out clean. 9) Take a tablespoon of strong coffee and mix with boiling water until the coffee dissolves. We will use a tablespoon of this coffee mixture and add it to the last portion and mix. After mixing we pour it onto a baking pan and let it bake for 30 minutes at 350 degrees F or until tooth pick inserted deep into the center comes out clean. 10) Add heavy cream into the mixing bowl with cream cheese (room temperature) and let it mix at medium speed until its fluffy. 11) Add cappuccino/sour cream/condensed milk to the mixture and mix with spatula. 12) Pour jello into boiling water and mix until jello will completely dissolve. Add it to the mixture. 13) Add made coffee to the mixture and mix well with spatula. 14) Since this cream is made with jello you will have to spread the cream fast/good amount on every layer of the cake. 15) After spreading cream on each layer of the cake i like to pour some dry cranberries or dry cherries ( your choice)on top. 16)You can decorate it any way you would like. I used some melted chocolate to decorate. Fourth layer : ^ the same as above except no cacao/ cappuccino but adding one tablespoon of strong coffee that was already made in water. Put in all the eggs into the mixer bowl and start it on medium speed. While it is mixing add sugar to the mixture Mix it until it becomes fluffy and is double the size. Add baking powder/sifted flour and mix well with a spatula. Cover a baking pan with a baking sheet and spray with stick resistance spray. The mixture we just made we will split into two equal portions. The first portion we will pour onto the baking sheet (let it spread all over baking pan and make it even with a spatula) bake for 30 minutes at 350 F , or until tooth pick inserted deep into the center comes out clean. The second portion that we have we will add cacao and mix it well. It will be a light brown color after you mix. The we pour it onto a different pan and bake for 30 minutes at 350 . 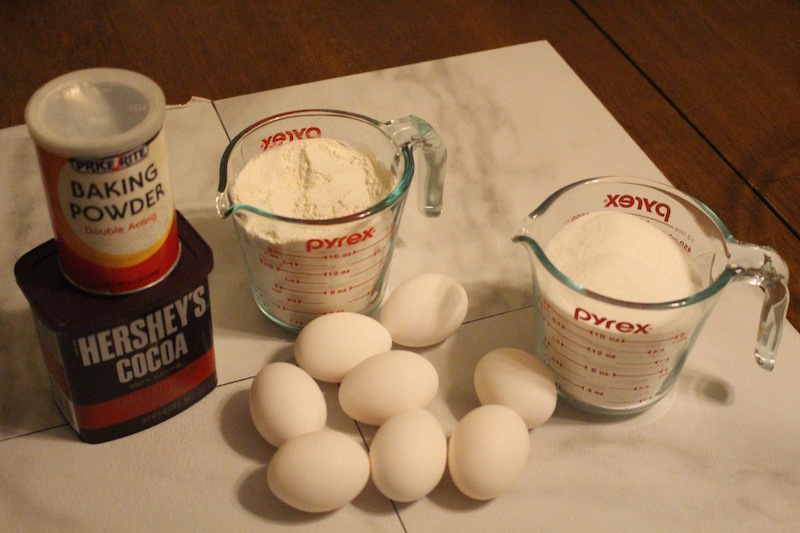 Put in all the eggs into the mixer bowl as you previously did and start mixing it at medium speed. While it is mixing add sugar. 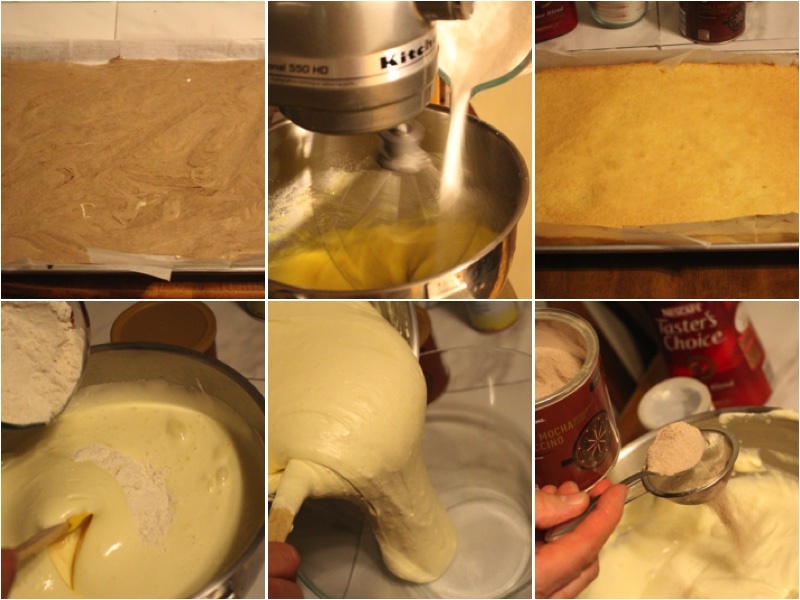 Add sifted flour to the mixture and mix well with a spatula. We will do the same thing here as we did above with diving the mixture into 2 equal portions. The first portion we will add cappuccino to and mix it. Then pour onto a baking pan and bake for 30 minutes at 350 F or until tooth pick inserted deep into the center comes out clean. Take a tablespoon of strong coffee and mix with boiling water until the coffee dissolves. We will use a tablespoon of this coffee mixture and add it to the last portion and mix. After mixing we pour it onto a baking pan and let it bake for 30 minutes at 350F or until tooth pick inserted deep into the center comes out clean. Add heavy cream into the mixing bowl with cream cheese (room temperature) and let it mix at medium speed until its fluffy. 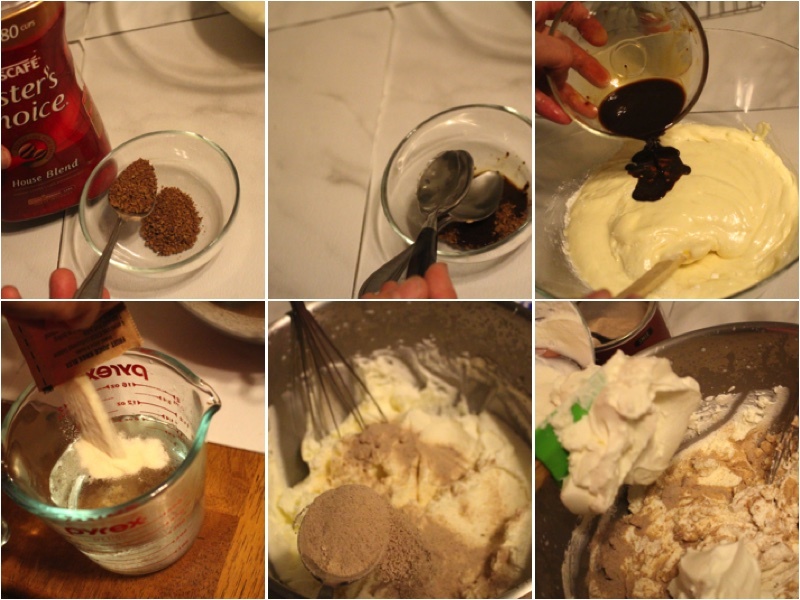 Add cappuccino/sour cream/condensed milk to the mixture and mix with spatula. Pour jello into boiling water and mix until jello will completely dissolve. Add it to the mixture. Add made coffee to the mixture and mix well with spatula. Since this cream is made with jello you will have to spread the cream fast/good amount on every layer of the cake. 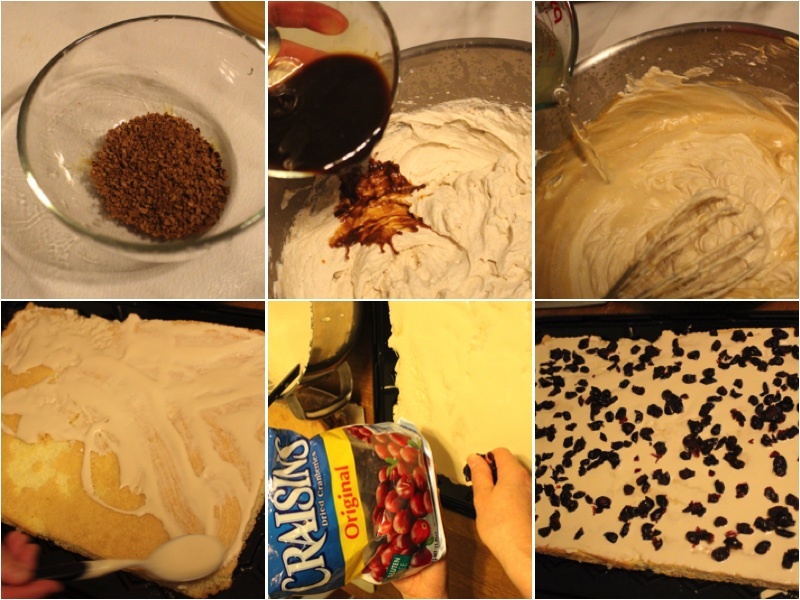 After spreading cream on each layer of the cake i like to pour some dry cranberries or dry cherries ( your choice)on top. This cake was so good! It’s like a cappuccino tiramisu cake, the layers are so moist and fluffy and the cappuccino cream is amazing! I’m almost drooling over my keyboard, looking at this cake. It looks very soft and I can only imagine the flavor ?. This cake looks so light and fluffy, I love cappuccino so can’t wait to try it. ? Hello Svetlana. I have two questions 😉 What size carton is the heavy cream? The jello is Gelatin, right? Heavy whipping cream is one quart (946 ml) I get it at Costco. One last question 🙂 Where do you purchase the cappuccino? I also live in MA. You can purchase it at a local Aldi, Walmart and other grocery stores near you. Use 2 Tbsp of water to dissolve it. This cake looks so good .. I would love to try it for an upcoming family gathering. I noticed that the layers are not soaked. 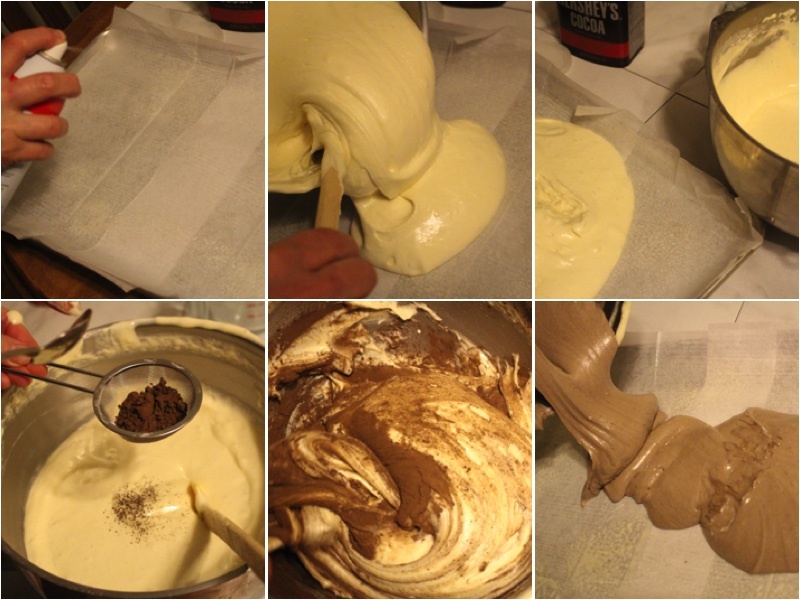 The cake doesn’t come out dry without any syrup on the layers before the cream ? You should try it out for sure and I hope you like it. This cake comes out pretty soft without soaking the layers.If you want it to be even softer you can soak the layers (take 1/2 a cup of apple juice and 1/2 a cup of boiling water and mix it together and then soak the layers). Let me know how it comes out. 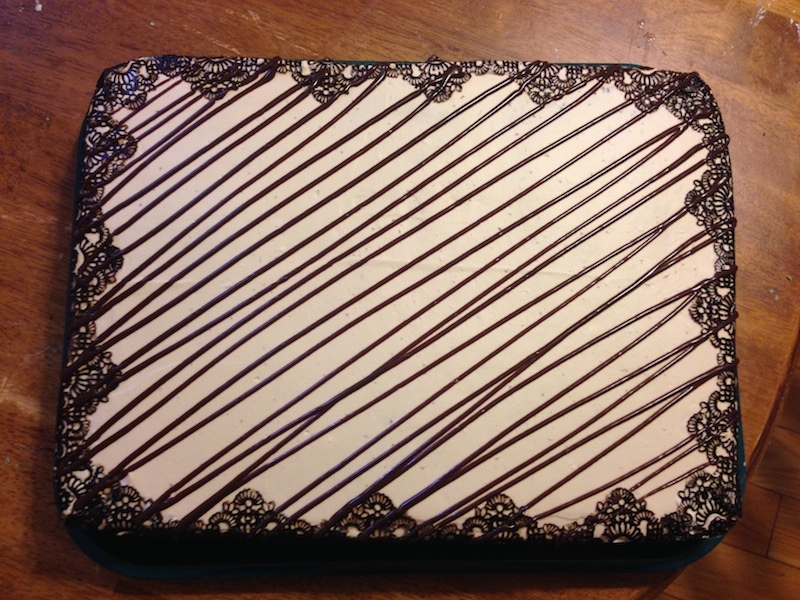 Svetlana, Thank you for posting this incredible cake! I am really excited to make it for my family! Would you be so kindly to clarify, by the picture you said that these ingredients 8 eggs+1c flour+1c sugar+1 tsp b. powder = makes 2 sheets. In the directions below, you said that 4 eggs+1c flour+1c sugar+1 tsp b. powder = makes 1 sheet. I am thinking that you mean: 8 eggs+1c flour+1c sugar+1 tsp b. powder = makes 2 sheets. I greatly appreciate your time and effort in sharing your great recipes. Thank you! 8 eggs should equal two layers. 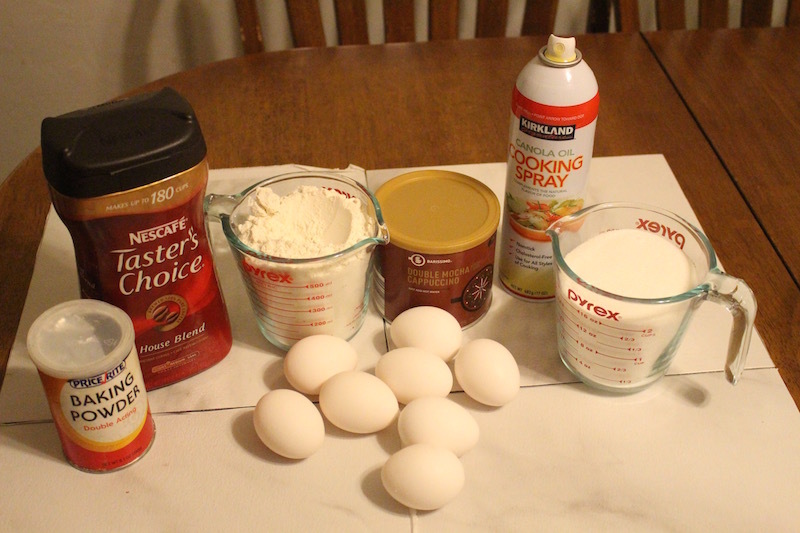 For 8 eggs of batter you would need 2 cups of flour + 2 Cups of sugar + 2 tsp b.powder = 2 layers so for every four eggs you would need 1 cup of flour and etc…The ingredient photo has 8 eggs pictured so the ingredients were doubled from 4 eggs. Made this cake the other week and it was delicious! 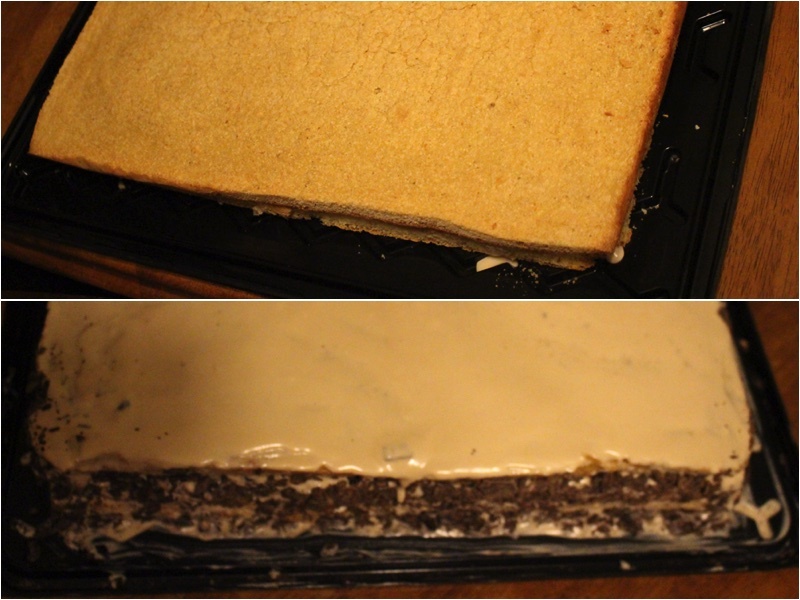 I did make a coffee simple syrup to soak the layer because our family prefers moist cakes. Thank you for your idea, Ill make sure to try it. What are dimensions of baking pan? a half sheet (12x18inches)? if this is “a party size version, so if you would like to triple the portion to make a large sheet cake click here.” Shouldn’t you multiply each below listed ingredient by 3 or 4 too? so, it has to be 3 or 4 table spoons of each dry ingredient for each layer? Hey I am unaware what part of this recipe u are quoting when you state: “a party size version, so if you would like to triple the portion to make a large sheet cake click here”. As far as any multiplying the ingredients for a desired portion size (different from the one I outlined and provided info for in 12×18 backing sheet size cake) I do not know the answer to that question as this is the only serving size I have done of this specific cake. Thank you.